Metadata is the data about data or the information about the information. It describes the other data. It gives information about content of a certain object or an item. Metadata is a structured data that describes, explains and locates an information resource which makes it easier to retrieve, use and manage. It describes the characteristics of resource. The term “meta” is derived from Greek word which denotes the nature of a higher order or more fundamental kind. For example, a metadata of text document contains information about the length of the document, number of words in the document, author of the document and abstract of the document. · Descriptive metadata: Describes the resources that serve the purpose of application like discovery and identification. This type of metadata includes elements like title, author, abstract and keywords. · Structural metadata: Describes or indicates how compound objects are put together. For example, pages are ordered to form a chapter in a book. · Administrative metadata: Provides information which helps to manage the resource. It is useful in business application to build business intelligence. It includes information like when and how the resource was created, file type, and other technical information as who can access it. An administrative metadata contains several subsets. · Rights management metadata contains the information which deals with intellectual property rights. · Preservation metadata contains information required to archive and preserve the resource. A metadata record consists of a number of pre-defined elements that represents specific attributes of a resource. Each element in the metadata record has one or more values. Metadata can be directly created in the database which can be linked to the resource. It is very useful and growing in popularity as it is an independent activity which creates resource themselves. html coding of the page. · It can be deployed as a separate HTML document linked to the resource it describes. Metadata records can be directly created in a database or it can be extracted from another source like web page. When syntax is not strictly followed in the metadata schema, the data in the record will unusable until the encoding scheme understands the semantics of it. Computer programs can process the metadata through encoding scheme. Data is computer stored information. The quality of the data can substantially influence on the three strategic vectors of organizations namely customer interaction, asset configuration, and power of knowledge. Hence data is an important resource for any organization competitiveness. Incorrect data during the period of customer interaction may lead to significant perceived quality problem by clients. High quality data can help the organization serves the clients better. It also improves inventory management, production and resources planning which is an important factor for asset configuration of an organization. Poor quality of data results in accumulating errors through the value chain and high quality data may reduce human coordination costs. Business analyst will be able to find proper insights in production and service processes and propose ways of improving them using high quality data. · Product based view: this defines the quality as the difference in quantity of some desired ingredient material in a product and reality. In total data quality management program both the views have been integrated and implemented the idea of fitness-for-use. Table describes the quality dimensions of total data quality management process. Total Data Quality Management is the program implemented to achieve the high state of data in an organization. Any organization irrespective of goals and operating environment, they have to develop their own specific total data quality management program. Regardless of the differences, an organization that is successful in the implementation of practical and efficient total data quality management consists of iterative process of defining, measuring, analyzing, and improving. · Develop a set of metrics that measure the vital dimensions of data quality for the organization and that can be linked to the organization‟s general goals and objectives. To implement total data quality management, the quality should be defined. Each company or industry should choose a definition that is appropriate to its goal and internal culture. Information of the company should be treated as a product that is delivered to the customer. 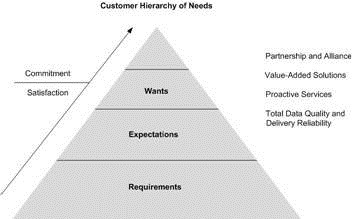 To understand the customer requirement, an organization should follow the customer hierarchy of need model which is shown in the figure below. This model implies that total data quality is a necessary condition and its lays the foundation for any customer-supplier relationship. To move up in the hierarchy towards the committed relationship is possible only with strong basic foundation. Understanding the requirements of the customers is the critical path towards the goal of creating committed relationship with customers and suppliers. Total data quality management is based on the Deming cycle version which has four main steps Plan, Do, Check and Act. Total Data Quality Management that is directed towards quality of data will have four steps namely Defining, Measuring, Analyzing, and Improving. The define phase of TDQM has three steps. First step of the define phase determines the characteristics of data products. There are two levels to describe the characteristics of product. The highest level describes the characteristics of total data product and lowest level describes the attribute of each product individually. The figure given below illustrates the difference between data products and data attributes. It is useful to focus more on the data products or attributes whose quality problems have highest impact on the organization. This process should be accomplished in the step one of the define phase. The step two of the define phase determines the requirements for the data products. · The perceived level of quality in dimension. · The expected level of quality in dimension. · The importance of the dimension. The step three of define phase determines the data manufacturing process. This process contains the data flow from supplier to the user of the data and also includes certain processing activities and quality checks. The knowledge of the data manufacturing process helps to get better understanding on the importance of quality dimensions. The clear defined process helps in data quality management by codifying processes, making them person independent and reliable. This phase of the data quality management determines the quality of the dimensions identified in the define phase. · Simple ratio: Is the measure of the ratio of outcomes of a selected variable to total outcomes of that variable. aggregation of multiple data quality variables. · The Weighted Average: Is appropriate when the organization determines the importance of each variable with respect to the overall evaluation of a dimension. 2. The step two of measurement phase, measures and presents data. 5% variance. There are several charts available to display the result of measurement. To identify the dimension which has caused the problem, the result can be displayed on Pareto diagrams. In this chart, the X-axis (horizontal axel) displays the errors in the different dimensions while the y-axis (vertical axel) displays the percentage of the errors in the different dimensions compared to the total number of errors. The Pareto charts provides an easy way to determine the dimensions that causes most of the problems. Among the three methods, Cause effect diagram is the most common and easy way to identify the root cause of the problem. The main goal of this step is to find out an answers for the questions like what the problem is, when did it occur, why did it happen, and how does it impact the overall goals of an organization. · Solution generations: A propose of this step is to use the information manufacturing analysis matrix to generate the solutions required to reduce the problems. · Select solution: This step of the improvement phase determine the impact of the solution and cost to design and implement the solution. It also considers the resource required to achieve the selected solution. Solution priorities can be stated when the importance of each evaluation criterion is known. · Action plan: this step determines the action taken to implement the selected solution. An organization should have a separate team to work on the action plan to ensure that the action is executed. Action plan has a project tracker that keeps the track of all actions and their status. The data quality management team should be well trained in data quality assessment and management skills. · Team leader: A senior executive member of the team who is able to implement chosen solutions. · Team engineer: A person who has knowledge on the methods and techniques used to implement the chosen solution. · Data suppliers: they have to create or collect data for the data product. · Data manufacturers: they have to design, develop and maintain the data and systems infrastructure for the data product. · Data consumers: These are the people in the team who set data product in their work. · Data product managers: These are the people in the team who are responsible for managing the entire data product production process throughout the data product life cycle. Next Post MSBI : BI # 22 : Business Intelligence – Tools & Theory # 14 : Introduction to Data Mining #1 : Definition of Data Mining & How Data Mining works?